A bill to help create a statewide inventory of buildings at risk of failing in an earthquake is gaining broad support from diverse interests in California, as the legislation makes its way to a second Senate committee vote on Tuesday. AB 2681, (Nazarian), passed the Senate Transportation and Housing Committee last week. It heads to a vote in the Senate Committee on Governmental Organization on Tuesday. Support in the Legislature has come from both parties, and a growing number of endorsements are coming from organizations representing California cities, the building industry, environmental interests, business associations and fair housing advocates. The bill provides cities and counties with the funding and tools they need to identify buildings that are vulnerable to serious damage or collapse in a major earthquake. The information will be provided to the Office of Emergency Services to create a statewide inventory that can be used in emergency planning, public disclosures, and other purposes. Organizations endorsing the legislation include the California Apartment Association, American Institute of Architects, Structural Engineers Association of California, City of Los Angeles, City of West Hollywood, Fair Housing Council of Riverside County, Inc., San Gabriel Valley Council of Governments, State Building and Construction Trades Council, U.S. Green Building Council, U.S. Resiliency Council and the Regional Black Chamber of Commerce San Fernando Valley. Annelisa Ehret Moe, a water quality scientist with Heal the Bay, expressed concerns for the environmental impacts a major seismic event could have in California. David Khorram, immediate past president of California Building Officials, and a leading member of the Seismic Resilience Initiative, praised the bill’s author, Assemblyman Adrin Nazarian, for introducing AB 2681. People have a right to be informed about the buildings in which they live and work based on the best information available. Knowing a structure is at-risk of failure in an earthquake is the first step to protecting vulnerable buildings that make up much of the state’s affordable housing stock, and of avoiding widespread homelessness that may result from a major quake. Studies indicate that widespread homelessness and resulting joblessness from an earthquake disaster would trigger billions of dollars of economic loss to communities and the state. Untold numbers of businesses would go bankrupt. Reconstruction costs alone are estimated at up to $113 billion. 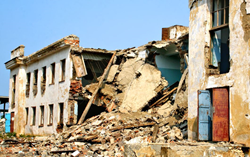 Many seismically vulnerable buildings contain asbestos and lead, which, when released into the air and groundwater from crumbled rubble will pose a public health problem of potentially overwhelming impacts. Preventing these structures from damage averts widespread exposure which can impact humans and nature. It also avoids the overburdening of landfills should the state need to dispose of the ruins of a major quake. The legislation has received widespread support from business leaders, who see the bill as an important step in protecting the economic health of communities and the state.